The Industrial Internet of Things (IIoT) connects all technologies, systems, and components involved in the industrial value creation process to each other as well as to company networks and the Internet. With connectively playing a critical role in this scenario, BitFlow announced it is shipping a new breakthrough I/O device for machine vision which provides an unprecedented 36 inputs and 36 outputs in a compact, DIN-rail mounted form factor supporting TTL, LVDS, open collector, opto-isolated and 24V signaling. Amazingly simple to deploy, the BitFlow BitBox is controlled solely by a BitFlow frame grabber, using the same API, driver and manual -- reducing space requirements and flattening the learning curve for customers. It contains 12-pin connector blocks that are added or removed easily, yet still lock securely in place for factory floor reliability. Blocks are logically grouped by signal type and have snap-in connectors that allow the fabrication of a harness without directly wiring the BitBox. 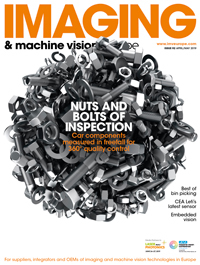 "In IIoT environments, machine vision helps in the monitoring of production processes to pinpoint weak spots and optimization potentials, along with the technology's traditional duty of identifying faulty parts; the challenge is connecting machine vision with other systems," said Donal Waide, Director of Sales for BitFlow. "Our new BitBox is a cost-effective, reliable way to connect and control dozens of devices such as strobes, solenoids and actuators, while acquiring data input from equipment ranging from photo detectors to triggers. It is the ideal solution for high-density networked systems." Until now, Waide explains, the answer for connecting machine vision components has been to purchase an I/O card. However, this step requires additional costs, software, system complexity, and the use of a PC slot. In addition, traditional I/O cards put all transmitters and recievers on the actual board in the PC, thus requiring wires to travel from their sources all the way back to the PC, which is often located quite a distance from other equipment. Besides being added potential points of failure, this extended wiring can cause signal lag, and even lead to employee trip-and-fall accidents. In contrast, the BitBox contains all transmitters and receivers with a small high-speed 15-wire cable running between the BitBox and the frame grabber. Maximum length cable is a generous 10 meters, providing maximum flexibility in positioning equipment within the machine. This arrangement isolates noisy, high-voltage signals generated by the PC away from the machine where they could cause data drops, video problems, malfunctions and random network errors. The BitBox was designed with maximum flexibility in mind. For example, outputs can be elected to be driven either to the static level via software API or configuration files, or from a frame grabber's internal signal generators. Likewise, inputs can be routed to a number of different blocks on the frame grabber. Input signals can also be routed to other outputs, including to the camera where it can also cause an interruption, or start/end acquisition.